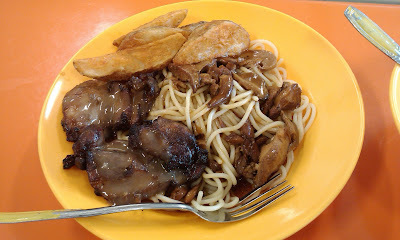 Contents: Mushroom spaghetti, chicken chop and potato wedges. 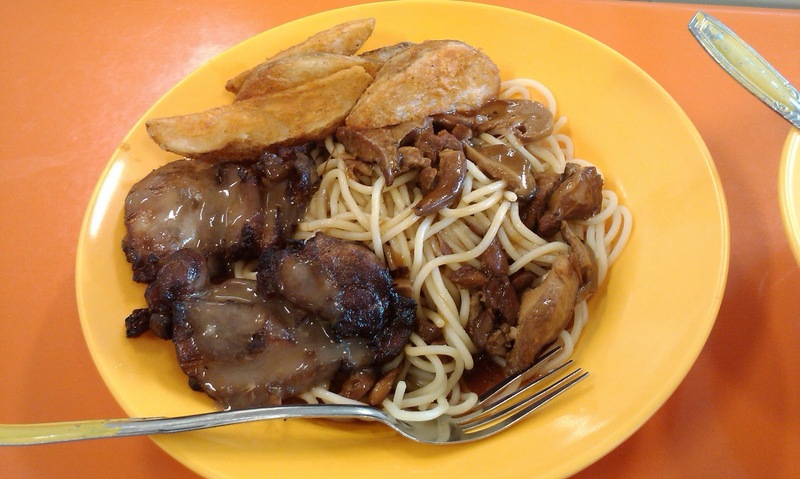 Notes: "As you can see, it's easy to choose an unbalanced meal despite all the healthful choices available. Perhaps the school should consider deploying a food colour police?" I think a great point is raised here. Just because good food is provided doesn't mean it will be eaten. There also has to be education and support of healthy choices at home. Great idea! At my school we used to have terrible food until they introduced a new system where you had to choose a vegetable with your meal or if not, something from the salad bar. That said, I was very privileged to go to a small independent school, which meant it wasn't funded by the state. In the UK the government has introduced breakfasts too as many kids were going in hungry. This was in some cases due to hidden poverty or and arguably worse, neglect by busy parents.